Alucard is not just any immortal, but probably one of the oldest and strongest beings known to exist. This vampire, however, is duty bound to the Hellsing family, who acts as the dogs of England's queen, protecting the country from the most dangerous parts of the underground, namely other vampires. 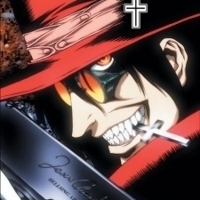 When he meets a young police girl who refuses to give up when confronted by another vampire, he turns her into the second vampire of the Hellsing organization. They have their work cut out for them, as a new rising breed of vampires emerges. 6584 users rated Hellsing [TV].